--> It was our anniversary. It was pouring down rain. We love rain on momentous days in our life. And I guess we love a little bit of crazy too. And that is just what we got. We were hanging out on the front porch when we discovered that our bees had swarmed in a nearby tree. It was accessible, so George Googled how to catch a swarm of bees. It involved a gun, climbing a tall tree, a large white sheet, and some raincoats. 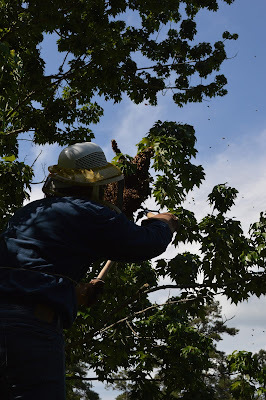 George climbed the tree, shot out the limb, which dropped on the first shot into the sheet I held below and immediately dumped into a nearby hive. All in a downpour! We didn't get any pictures of that swarm for obvious reasons. Based on the crazy, redneck methods we have utilized in the reclamation of our bees, we've made sure to document our swarm catching procedures since then. 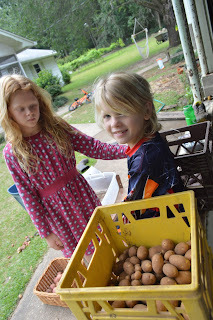 Potatoes from our spring harvest. We’ve got a one legged rooster. Well, he’s got two, but one doesn’t work at all so he holds it tight to his chest and proudly hops around straight up in the air and back down again. His story must be told. . . Pistol was king of the castle. He took care of all his ladies. He didn’t leave any of the hens out from his daily routine.Even if they wanted to be left out, he made sure to meet with them daily. He was brave and generous. He often would find bugs or frogs or little snakes and straight away deliver them to one of his beauties. He took care of them and made sure they stayed safe. There were even a few other roosters in his pack, but he let them hang around and probably taught them a thing or two. --> Oak snakes hang out at our place. There is a fine assortment of tasty treats available for them to eat, so they find it a delightful place to live. And it’s Florida. We've got snakes. The kids love to catch the oak snakes and play with them for awhile before we release them somewhere far away from the coop with eggs. Yesterday, Amelia spotted an oak snake slithering along and hollered for capturing assistance. We grabbed our oak snake trash can and headed to assist. Lucy, our dog, came along for the adventure, but what we didn’t know is that she is a snake attack dog. Before we could do a thing, she had that snake by the neck – or something like that – and was whipping it around and around. It was wild! We all sat there and stared wide eyed as Lucy took that snake down. Confession: My sweet friend Dana and I did some serious helicopter parenting today. Between the two of us, we have eight children. We’d planned a bunch of play time at the local springs today, but the weather wasn’t cooperating, so we hit up our local history museum for some sweet air condition and indoor play on a gray day. The museum has a “grandma’s attic” area packed with great dress up clothes. We rummaged through crazy outfits and dressed up with the kids and pretended to go back in time with them. I’m talking not even a slight hover. We actually got in between them! We had quite the time pretending to step back around the corner of time and act like we were somewhere between Little House on the Prairie and Woodstock. Hannah. Busy. She wakes up and sprints to the kitchen. Grabs the gallon of milk from refrigerator and thumps it to the floor. Then she grabs a sippy cup and grunts for a fill up. With milk in hand she toddles over to the cabinet and grabs a bowl. “Mo,” she says, asking for more of something in her bowl. Bowls. They are all over our house -- along with toothbrushes. We can’t ever find the bowls or the toothbrushes. She wants a bowl full of something to snack on. Of course she is hungry. She doesn’t stop moving. She finds toothpaste no matter where I stash it. The kids get it back down and she finds it. There is tooth paste in the carpet, on my pillow, on my shoes, in my hair, on the cabinets, and on the wall too. If we mention the pool or swimming, she runs to the back door, rips off her diaper, tries to take off her clothes, and yells, “Pool!” With a mad dash to the pool, she jumps in without fear over and over and over and over again.